Lille (Dutch: Rijsel), the fourth largest city in France with around 1.2 milllion inhabitants living in the metropolitan area, is in the far north of France, near the border with Belgium. It is the administrative centre and largest city in the region of Nord-Pas-de-Calais. The town's history goes back a thousand years, when it was an important trading town on the river Deûle. Lille was initially the possession of the powerful Counts of Flanders, but was taken over through the years by Burgundy and Spain before Louis the XIV took the town in 1667. He fortified the town, some of those fortifications can still be found today. In 2004, it was designated as a European Culture Capital. The Town Hall and the Belfry was designed by the architect Emile Dubuisson. The town hall was built in the 1930s, and the belfry (clock tower) was the first building in Paris to be over 100 metres in height, and today is a Lille-Lesquin International Airport is located 10 kilometres from Lille city centre. There are few flights. The main destinations include Algiers, Lyon, Bordeaux, Marseille, Nantes, Toulouse, Strasbourg, Clermont-Ferrand, Casablanca, Marrakech, Girona, Porto and seasonal flights to Ajaccio and Bastia on Corsica (summer season). 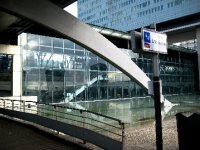 A Shuttle service from the airport to the city centre to the Euralille shopping centre. The ride takes 20 minutes. Tickets cost €5 one way ticket and €8 return. Lille is an important stop on the TGV and Eurostar network, linking London, Brussels, Paris and the rest of Europe. As such, it is easy to get to by Train. Lille Europe Station has Eurostar service to London and Brussels, and direct TGV service to Roissy Airport, Paris and major French cities. London is 80 minutes, Paris is 90 minutes and Brussels is 36 minutes away. Lille Flandres Station has local TER regional trains and other direct TGV service to Paris. Montpellier - 5 hours, 5 direct TGVs a day. Train tickets can be found at SNCF (internal France), Eurostar (London or Brussels) and TER for local trains. Lille is on six different motorways. The A1 goes to Paris. The A22 leads to the E17 to Ghent, Antwerp and Amsterdam. The A23 goes to Valenciennes. The A25 goes to Dunkirk and the A26 to Calais. The A27 leads to the E42 leading to Brussels. Eurolines offers connections to several cities within Europe. Traffic can be bad in the medieval centre of Lille, where narrow, winding streets can quickly get clogged during rush hour. However, in general the city is well sign-posted and it isn't too hard to get around. There are public parking with 20,000 parking spaces as well as several multistory car parks in the city centre, in addition to on-street pay-and-display ticket parking. Parking varies from between €1.30 to €1.60 an hour, depending on the location. Ilévia (FR) provides services in city on 2 subways, 2 tram lines and over 60 bus routes. A daily pass costs €4.90 (up to 7 days €16.75). Individual tickets cost €1.65 with 10 tickets for €14.45. 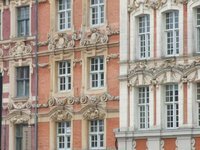 The centre of Lille is very compact and a majority of the sites are within walking distance from each other. The city is relatively flat, so walking is easy. Since September 2011, Lille is now one of the few French cities with its own public bicycle sharing system, called V'lille (website only in French at the moment). Each V'lille station is equipped with an automatic rental terminal and has stands for dozens of bicycles. Maps showing the locations of the city's V'lille stations are available at all kiosks. In order to use the system, users need to take out a subscription, which allows the subscriber an unlimited number of rentals. Subscriptions can be purchased at €1.40 per day, €7/week or €36/year. With a subscription, bike rental is free for the first half hour. A trip that lasts longer than 30 minutes incurs a charge of €1 for each subsequent 30-minute period. You can get a 24 hour or a week subscription at any kiosk and you will need €200 on your creditcard to use as a deposit (not cashed unless the bike is damaged, stolen, lost or not returned for more than 24 hours. Coq Hardi - Place Nouvelle Aventure, 59000 Lille, France, 03 20 85 26 58. Lunch at 'Coq Hardi' is busy and satisfying. The young waiting staff give the restaurant a fun and light atmosphere. If you get the chance, try the Andouille poêlée sauce moutarde for a good traditional French dish. Aux Moules - 34 Rue de Béthune, 59800 Lille, France, 03 20 57 12 46. Down Rue de Bethune, 'Aux Moules' is agreeable and reasonably priced, and although in danger of being a tourist trap, it succeeds in delivering good food in a lively and casual atmosphere. Quai du Wault - 59800 Lille, France, 03 20 30 16 11. For somewhere aside from the bustle, head to the Quai du Wault and enter the restaurant of the same name. The food and service are of high quality and at a good price that certainly won't break the bank. If you are a cheese lover try the maroilles dishes. Another must is the interesting variation of a hamburger. Lille is a big university city, and like most university cities, lots of bars with cheap drinks can be found. There are many bars and clubs along rue Solférino, rue Masséna and the surrounding streets, with drink deals during a happy hour early in the evening. You can also try the bars in the Wazemmes neighborhood, especially around place de la Nouvelle Aventure where the Wazemmes Market takes place, for a bit more relaxed drink. And of course the Vieux Lille, especially around rue Royale where you can find all sorts of different bars, it's usually a bit more pricey than Solférino but the atmosphere is different. Ecole Centrale de Lille (Lille Central Graduate Engineering School). 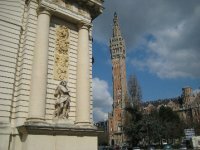 We have a comprehensive list of accommodation in Lille searchable right here on Travellerspoint. You can use our map to quickly compare budget, mid-range or top of the range accommodation in Lille and areas nearby. I have been a student in Lille for 6 years now and I know the city by heart, I was an ISEP ambassador for foreign students at my university and I also host on couchsurfing, so I know very well what new people need to know about the city, what you can do there and whatnot :) I would be more than happy to share my knowledge with anyone in need! This is version 48. Last edited at 11:22 on Mar 19, 19 by TilooPniout. 32 articles link to this page.